Anyone else feeling a bit tight these days? Are you struggling to make ends meet? Or just trying to put money away with little success? As our family has grown, we've always been frugally minded. However, with gas, groceries, and everything else on the rise...except my husband's paycheck...we've really had to tighten up and be wiser about our spending. And did I mention that we're also planning a wedding? 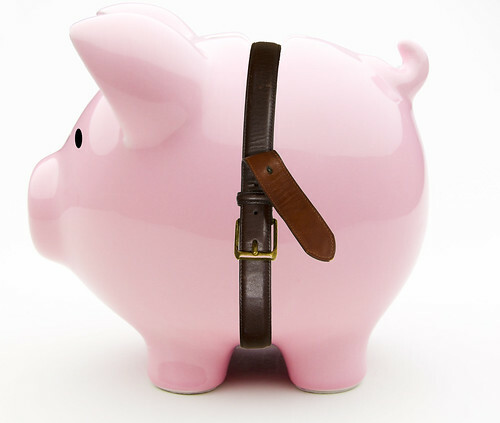 Here are 8 ways that we have cut expenses to survive the economy crunch! We often calculate how much it will cost to drive to Grandma's out of state, or to the amusement park in the next city, but what about those frequent "short" trips? Those sudden trips to the grocery store or those trips to Sonic for Happy Hour. ;-) It's important to know what even your short trips are costing because they add up quickly. First, find out how many miles your vehicle gets to the gallon....in city. Now, think of a place you go often. How many miles is it from your home? Divide the total miles of your trip by how many miles your vehicle gets per gallon. Then multiply that result by the cost of gas per gallon. This will tell you how much your trip costs. Formula here. For instance, Sonic is 4 miles from our home. So round trip is 8 miles. Our van, "Clifford, the Big Red Van" only gets about 10 miles to the gallon (pitiful, I know). SO, it will cost me $2.52 (current price per gallon $3.15) to get to Sonic and back. So now, my half price large Diet Coke just cost me $3.52 instead of $1.00. If I do this everyday, I've just spent $105.60 in one month for Diet Coke. Scary huh? It's so important, if you're struggling financially, to calculate your gas costs. We've had to cut out a lot of frivolous trips to save on our gas budget. If you've got a fuel efficient car, it may not be so bad. But with a 15-passenger van and a Suburban, we really have to pay attention to our fuel costs. Turn up (or down) that thermostat! We've all heard that during the summer, we should keep our thermostat at 78 degrees or higher. How many of us actually do this? We do. You'll be amazed at how quickly you acclimate to a warmer temp in your home. Now that we're approaching winter, try setting your thermostat one to two degrees cooler than usual. When shopping for groceries, be sure and look at the unit price when comparing prices. Look at the price per ounce or pound to find the best bargain. If you're set on a particular name brand item, search for a coupon first or price match it if your local store does this. Buying in bulk is often a great way to save money, but be careful! Buying in bulk may not always be the best option. For example, we shop at Sams. Sams carries mostly name brand items. Even though they may be cheaper than the traditional grocery store, most time, buying the generic store brand will be less expensive than buying name brand bulk. If you're accustomed to eating out a lot, you can save huge by eating at home. Plan a menu and make a coordinating shopping list. And stick to it! This will also prevent those frequent store runs since you will already have everything on hand to prepare your meals. Check for used items first! If you need something for your family or your home, don't forget to see if you can find it used first. Chances are, depending upon the item, you can find it on eBay or Craigslist. If you need clothing or Children's clothing, don't forget about those great thrift stores. Look around your home and let go of things you don't need. Sell books, toys, baby items, furniture, etc. It's always fun to bring in a little extra cash from things you weren't using anyway. After seeing a friend's FB status about cashing in her unused gold jewelry, and getting more than she thought, I went through my small stash and found three broken gold chains and a small ring I never wear. I took them to Gold Gals and made a quick 76 bucks from broken jewelry I may have ended up throwing out. I'm tellin' ya! If you haven't done this yet, you're missing out on free stuff. I purchased most of my home schooling material last year from Amazon credit that I earned from Swagbucks for free. In addition, anytime I want a new book, or birthday gifts for our children, I build up my Amazon gift credit by buying Amazon gift cards with my Swagbucks. Currently, I am saving up for Christmas shopping. 450 SB gets you a $5 Amazon gift card. I usually accumulate 450 SB every week to week and a half just by doing regular Internet searches. But there are other ways to rack up the Bucks, too. How have you managed to cut back on your budget? What would you add to this list? I find from scratch ways to make convenience foods. I love Tasty Kitchen and All Recipes for that. I just found a scratch recipe for chicken enchilada soup, so I don't have to buy the mix from Homemade Gourmet. I'm making it tonight so I hope it is good!